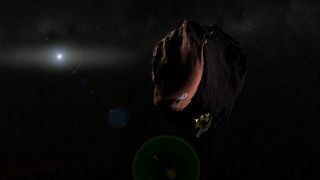 Artist's conception of NASA’s New Horizons spacecraft encountering a Kuiper Belt object, part of an extended mission after the spacecraft’s July 2015 Pluto flyby. New Horizons is set to fly past 2014 MU69 – a KBO currently about a billion miles (1.6 billion kilometers) beyond Pluto, on Jan. 1, 2019. Happy birthday, New Horizons! Today marks the 11th anniversary of the launch of NASA's New Horizons spacecraft, which flew by Pluto in 2015. To celebrate, the New Horizons team is hosting a live webcast today at 4 p.m. EST (2100 GMT) to discuss the historic Pluto flyby and the tantalizing adventures that still lie ahead. Now hundreds of millions of miles past Pluto, the spacecraft is currently on its way toward the outskirts of the solar system with its eyes set on another distant target: 2014 MU69, a small, icy rock inside the Kuiper Belt. It is scheduled to fly by there on Jan. 1, 2019. During the webcast, several team members will speak about the mission's biggest discoveries so far. Some contenders on that list may include Pluto's giant, heart-shaped feature known as Sputnik Planitia, its underground ocean, and the strange relationship between Pluto and Charon, its largest moon.